« Did Caesars Really Just Try to Unload the Rio and the WSOP? On Sunday night, Las Vegas Sands said that it had made no such disclosure of violations of the anti-bribery provisions and that violations of those provisions had not occurred. “The company said it will vigorously defend itself against that type of uninformed and misleading reporting,” Las Vegas Sands said in a statement. Numerous media outlets, national and international, reported on the allegations of potential federal law violations over the weekend. The Wall Street Journal was the first media outlet to report the story Friday night. The Las Vegas Review-Journal reported the story Friday night on its website and in its Saturday editions. News of the violation allegations caused shares of Sands China Ltd., the Macau casino subsidiary of Las Vegas Sands, to fall 1.5 percent on the Hong Kong Stock Exchange in overnight trading. Macquarie Securities gaming analyst Chad Beynon told investors Monday morning that the new Chinese national government has undertaken several moves investigating corruption. Beynon speculated that if Las Vegas Sands were to be fined for a Foreign Corrupt Practices Act violation, it would be for less than $1 billion. “Base FCPA fines are adjusted if high-level personnel were involved or if there was pervasive tolerance, which we don’t think would apply here,” Beynon said. 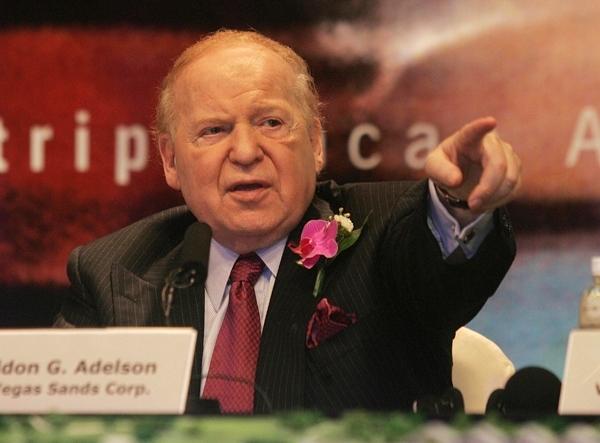 Adelson, 79, is a hot-button figure because he is one of the richest people in the world. Last year, Forbes estimated his fortune at almost $25 billion. Adelson was the largest single donor to Republican campaigns during the 2012 election cycle, contributing more than $100 million. Las Vegas Sands, which operates casinos on the Strip and in Macau, Singapore and Pennsylvania, said a potential violation of the accounting provisions could range from a single transaction recorded incorrectly to other errors in the accounting records. In February 2011, the SEC asked Las Vegas Sands to produce documents relating to its compliance with the Foreign Corrupt Practices Act. The company also was advised that the U.S. Department of Justice was conducting a similar investigation. Las Vegas Sands’ casinos in Macau and Singapore provide the company almost 80 percent of its annual revenues and cash flow. The investigations arose after allegations of bribery of foreign officials were raised in the wrongful termination lawsuit filed in October 2010 by Steven Jacobs, the company’s former CEO of Sands China. The lawsuit is pending in Clark County District Court. In the annual report filing, Las Vegas Sands said the preliminary findings of the audit committee and attorneys found that any violations do not materially affect the company’s financial statements, nor do they warrant any restatement of Las Vegas Sands’ past financial statements. Las Vegas Sands said the possible violations “do not represent a material weakness in the company’s internal controls over financial reporting” as of the end of 2012. Shares of Las Vegas Sands were down 1 cent, or 0.02 percent, to close Monday at $51.30 on the New York Stock Exchange.